How many of us dream of making the trip to Antarctica, to experience the wildlife and an environment so very special yet fragile? By far the most popular cruising area for its interest, dramatic scenery and accessibility is the Antarctic Peninsular stretching towards South America. Most cruises make a round trip from Ushuaia in Argentina, but if you are looking for a select cruise and the thought of a rolling two day passage across the Drake Passage doesn’t appeal or perhaps you have time constraints, then Antarctica XXl have the answer. They started working on the concept of fly cruise trips to Antarctica back in 2001, with the first trips taking place in 2003. Couple a short, less than 2 hour, flight from Puntas Arenas to the Chilean Base at Frei on King George Island with a cruise on a modern ship taking in the magical waters between the South Shetland Islands and the Antarctic Peninsular and you have a winner. These are boutique, expedition style cruises that offer smart surroundings and a stimulating atmosphere. Besides the marvel of just being in Antarctica – sailing amongst icebergs, past magnificent ice covered peaks – you can look forward to shore visits, short walks, Zodiac boat explorations and while aboard you’ll be able to learn all about the Antarctic from talented guides who have extensive knowledge of the nature, history and conditions of this region. What do you remember of your first sight of Antarctica? What surprises you about Antarctica? The immensity and purity of everything around us. It is by definition the last wilderness, we are guests to this continent and that is very easy to understand. The roughness and beauty, the contrast. Basically if you find place that can give you a hard time in the morning and the best time of your life in the afternoon… you have to love it. Of the places you cruise in Antarctica can you pick out one that has made a special impression on you, say for the wildlife, ice, geography, beauty …? This is a very difficult question as the places change every season, the landscapes will change forms, the wildlife behaves differently every season and the weather conditions can make of the most beautiful place on earth the worst of it. At any case the whole of the Antarctic Peninsula is a beautiful area, were we can find high concentrations of wildlife and good ice action. Just being able to be out there, in Antarctica, knowing the places better than my home town is what I love the most. Also the people we meet in this type of trips are very special and it makes the whole trip nicer. And the wildlife, ice, sea, geography, experiences, moments .. 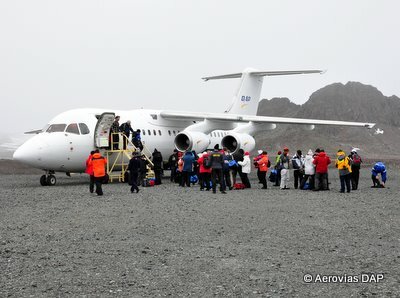 The hop over the Drake Passage is accomplished in a 70 passenger, BAE-146 plane, operated by Aerovias DAP, a Chilean Regional airline who have a long experience of flying in this region. The BAE-146 has short take off and landing requirements making it particularly suitable for the shorter runaways of this kind of destination. Zodiacs, rigid inflatable boats driven by outboard engines, are the way you get from ship to shore in the Antarctic. Before leaving for Antarctica you’ll get instruction on getting in and out of them – usually it only takes a few trips to get the knack – and you don’t need to worry about getting your feet wet as knee high boots are provided. The M/V Ocean Nova is a tidy ship combining comfort with practicality. Built in 1992, to sail amongst ice in Greenland, she has an ice strengthened hull and features a glass enclosed observation lounge to take full advantage of the stunning scenery. She carries 68 passengers, a nice number for a mix while still being intimate. All cabins are outside ones with private facilities and include single, double and triple options. As with all Polar cruises, itineraries are not set in stone and will vary to make the best of the weather and ice conditions. For the 2012 – 13 season which runs from November to February the company are offering three cruises with different targets. The objective of the Classic Cruise is the Lemaire Channel at latitude 65 South, with visits to places like Livingstone Island, Port Lockroy, Peterman Island and Paradise Bay. While the Heroic Cruise sets crossing the Antarctic Sound towards the Weddell Sea as its target. Paulet Island with its massive colonies of Adelie Penguins and Hope Bay are likely spots to be visited. Both these cruises are 7 days/6 nights long. A little longer at 9 days/8 nights, the Polar Circle Cruise aims to cross the Polar Circle at 66 33′ South. The Cierva Channel, Peterman Island, and Paradise Bay – with its fantastic iceberg forms- are likely stops enroute. For those fired by accounts of the Beagle Channel and Cape Horn there are also a couple of Express Air-Cruises which depart from Ushuaia in Argentina and explore these mythical waters before crossing the Drake Channel in company of Albatrosses and Giant Petrels to the South Shetlands. The return journey to Punta Arenas is by plane.